I was cleaning up part of our "attic collection" last week and ran across this little fixture I'd made up almost 30 years ago, in the days when Richard and I were building guitars. 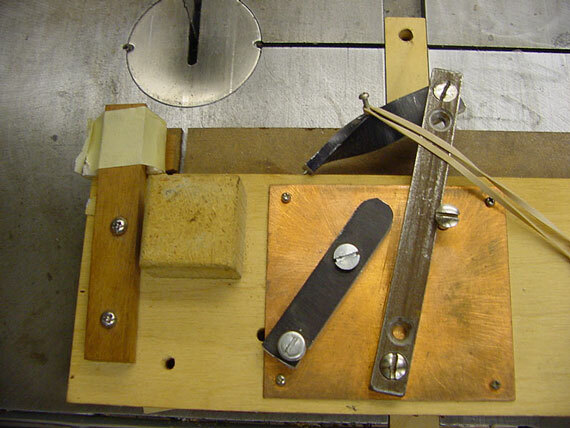 Its a gizmo for cutting kerfed linings on our old Delta 14" band saw. 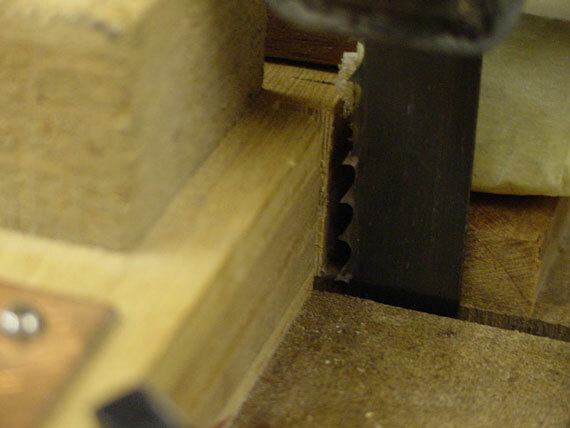 The fixture come right up to the bandsaw blade which cuts the kerfs almost all the way through the back side of the lining. 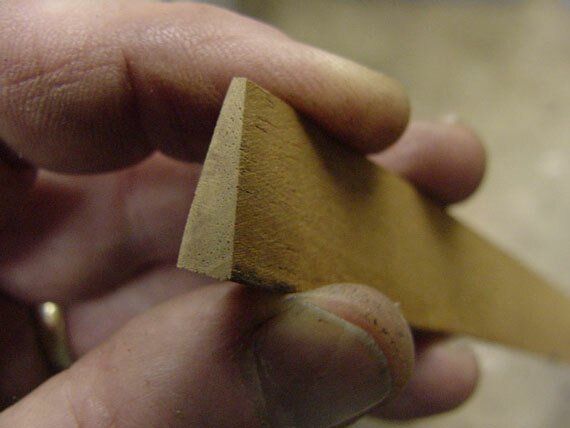 On the bottom, I've stuck a couple of shims for micro adjustment of the angle of the backstop to the blade, so the kerf will be a nice uniform depth. 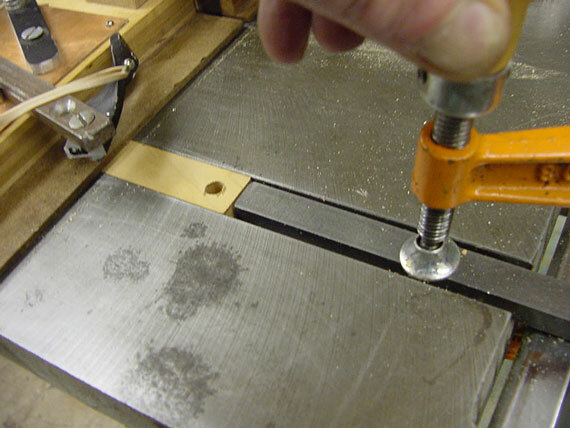 A simple stop clamped in the slot adjusts the depth of the cut. 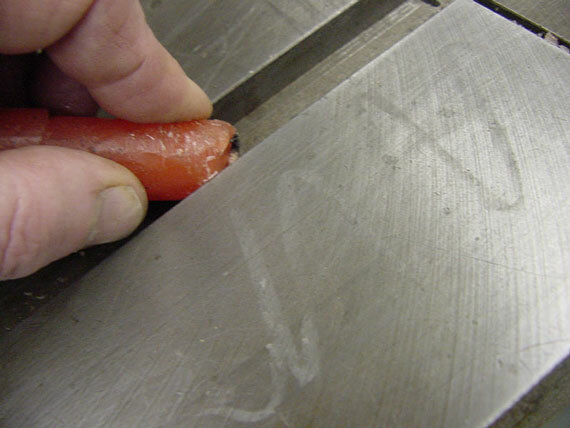 This little pointy rod grips the lining to advance it incrementally. 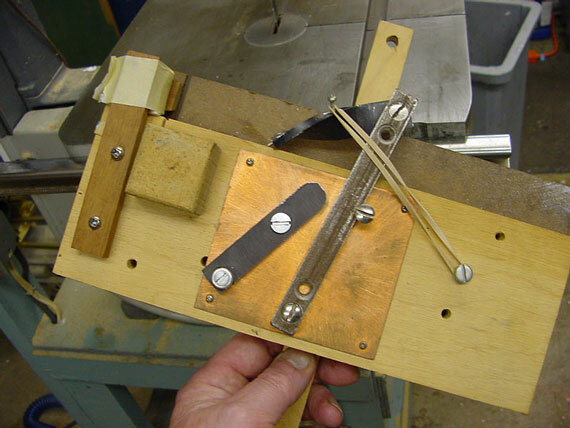 It started out as a regular old Victrola needle, which is very hard steel indeed. I found it gripped better with a chisel point. Here's the adjustment for the spacing of the kerfs. That tall stack of washers is there because I didn't have a short screw at the time. . . I made up a bunch of mahogany lining pieces by milling them on this same band saw with the table tilted, and by sanding them against a fence with a disk mounted on my table saw. As the lining material is kerfed, it feeds through this end of the fixture, and is held down by a bit of plastic foam taped in place. 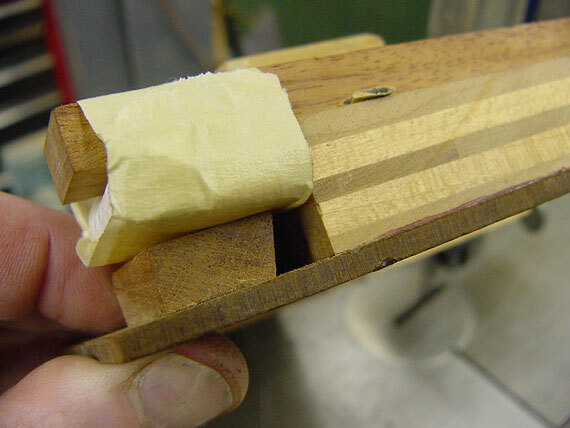 Held in this way, the cut end of the lining doesn't flop around causing the cut to vary. 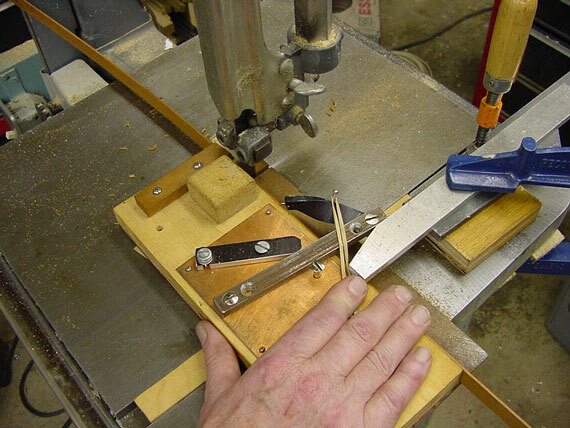 Finally, I clamp a tapered piece that contacts the push rod each time the fixture is advanced toward the blade. 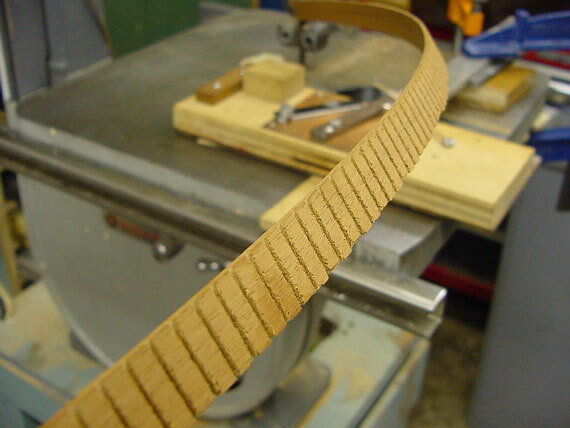 Just before the kerf is cut, the lining gets pushed laterally by one increment. And, quick as you please, a nice uniformly kerfed lining emerges. 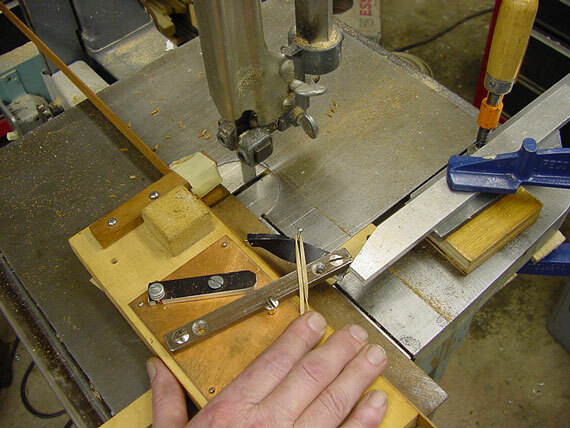 For this demo, I set up the tool using the blade I already had on the saw. 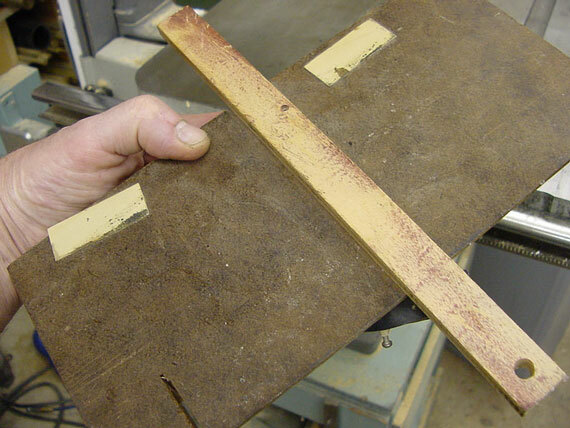 It was a 1/2" general purpose, 4 TPI blade. 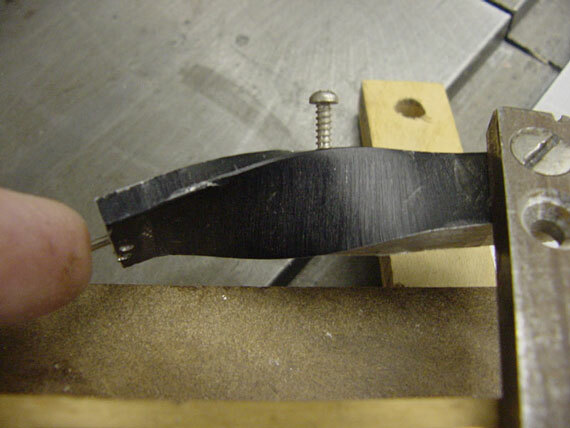 In practice, I'd prefer to use a 12 to 18 tooth narrow kerf metal cutting blade, which makes incredibly clean narrow kerfs with no loss of efficiency for such shallow cuts in thin stock. So here it is in action, in "slo-mo." Click on the photo for a bigger view, or click here if you have a fast connection and would like to see a little MPG movie of the fixture "up to speed."